Posted by Jill (@bonnjill) in ATA, Fun stuff. 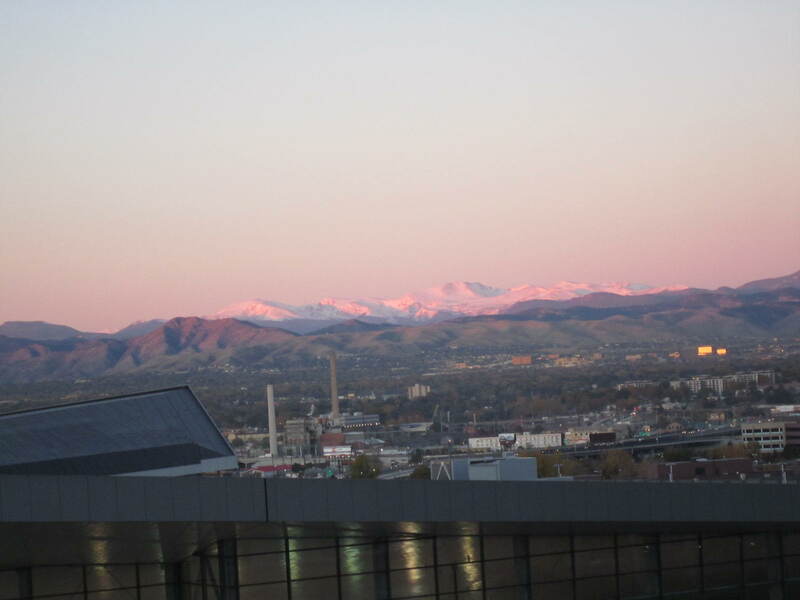 Greetings from the 51st ATA Conference in Denver, Colorado (the photo to the left is the view from my hotel room this morning). I am really enjoying meeting so many of you loyal readers face-to-face. I encourage you all to post comments, because sometimes it feels like I am writing into a vacuum. I am so gratified to hear that so many of you enjoy the blog. I know I enjoy writing it. I have started a list about upcoming topics I would like to write about and have also spoken with several people about possibly writing guest posts. 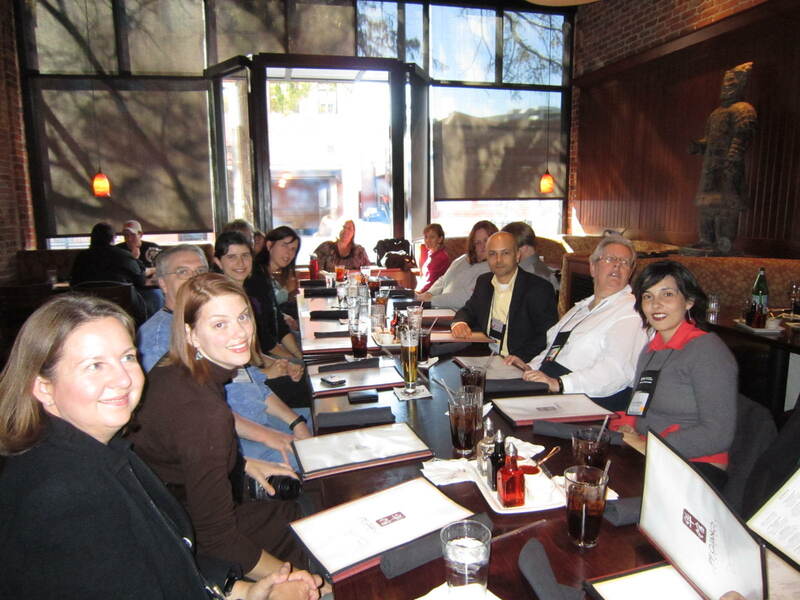 We had our 3rd annual Blogger Lunch today. After an initial bit of confusion locating the restaurant, approximately 20 bloggers and readers ultimately enjoyed a nice meal at PF Chang’s and hopefully enjoyed chatting with those around them. I know I enjoyed chatting with everyone. Some of the bloggers who attended were Tess Whitty (@Tesstranslates) from Swedish Translation Services, Fabio Said (@fidusinterpres) from Fidus Interpres, Abigail Dahlberg (@thegreenerword) from The Greener Word , Michael Wahlster (@Translatethis) from Translate This!, Tom Ellett from The Wor(l)d Weary Translator, and Eve Bodeux (@ebodeux) from Bodeux International and the Speaking of Translation podcast. I hope I haven’t missed anyone. I would like to thank Eve Bodeux for choosing the restaurant and making the reservation. I would also like to thank all of you readers who joined us today. I hope you enjoyed talking with my fellow bloggers and perhaps were inspired to start your own blog or perhaps offer a guest post every once in a while. The most difficult part of blogging is coming up with new ideas for posts and keeping things fresh. By meeting you face to face I hope everyone walked away from this lunch with a deeper appreciation of the symbiotic partnership between blogger and readers. Posted by Jill (@bonnjill) in Fun stuff, Translation. One of the members of the ATA German Language Division shared an interesting blurb from the October 16-22, 2010 edition of the Feedback section in New Scientist with us, and I thought you might enjoy it as well. Thanks, Cantrell! DO YOU enjoy eating cabbages? We’re not sure whether the teenager known online as binarypigeon does, but her mother tells us that when she wanted to test the limitations of online automatic translation systems, she typed the phrase “I enjoy eating cabbages” into one. She told it to translate this into Japanese – and then translate the resulting phrase back into English, and then translate that to another language, and then back to English, and so on. In the light of this, Feedback hopes that international bodies like the United Nations will continue to rely on human translators rather than mechanical ones for a while. Thanks Feedback and thanks binarypigeon! I think this example shows that machine translation still has a long way to go before it will ever be a viable option to replacing a human translator. It’s that time of year again – the ATA Conference is upon us and with that the ever popular Blogger Lunch for fellow bloggers and those of you who read our blogs. Several people have been asking me about the lunch at the conference this year. Thanks for keeping me on track. I have become the Queen of Procrastination this year, and it is driving my sister crazy. Since Eve Lindemuth Bodeux and Corinne McKay are local I suggested they choose a spot. Eve suggested PF Changs on 15th and Market. 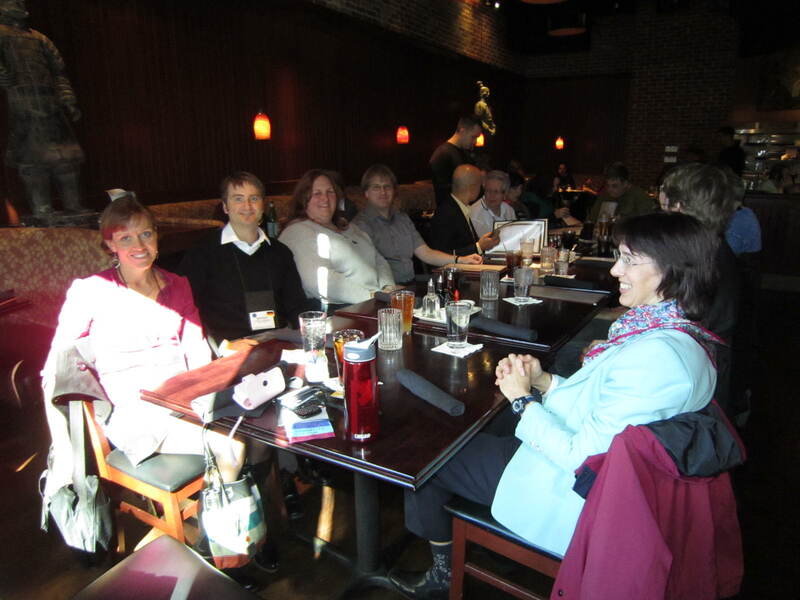 We have traditionally met for lunch on Thursday, the first day of the conference. We will meet in the lobby right at 12:40 or so. I will be presenting the First-Time Attendees presentation until 12:30. Feel free to meet me in the back of the room if you want to be sure to find me. I just ordered my business cards for the upcoming ATA Conference and am putting the finishing touches on my resume so that I can send it to Kinko’s. My friend Susanne is redesigning my website (hopefully in time to launch for the conference), and we have come up with a cool branding idea that builds off the template for my blog. My website will feature the sun and summer colors (get it? summer? Sommer? yeah, we’re clever like that 🙂 ), while the blog will feature the moon (since I’m overworked). I ordered business cards that tie in with the new website and will be ordering cards for the blog as well. I have always paired my resumes with the color of my website. Our field isn’t as stuffy, so I have always printed my resumes on a light blue paper to make them stand out from the typical off-white and cream resumes. This year I will be printing them on a light yellow paper that matches my new business cards. Resumes can be placed on the table in the Job Exchange of the Exhibit Hall. 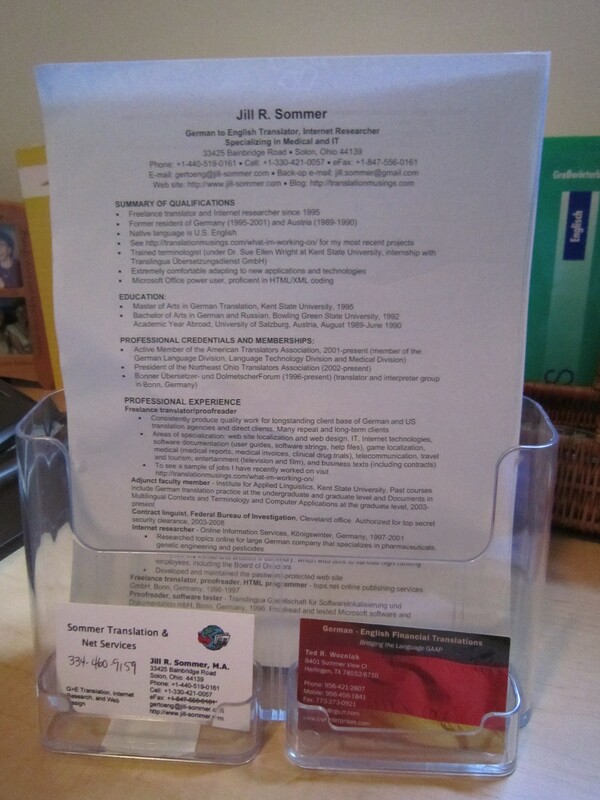 I use a plastic stand with built-in slots for matching clear business card holders so that my resumes do not get covered up by other resumes or separated from my business cards. You can find them at Office Max, Staples and most office supply stores. All this conference preparation has reminded me that many of you new translators and those of you who have never attended an ATA conference may not be familiar with how we in the industry write our resumes. A resume is a one to two-page summary of our relevant skills, experience, and education. It must be brief because the reader typically spends less than a minute reviewing its contents. You need to make sure your resume is concise, well written, and that the most important information that translation companies look for is immediately visible (such as your language pair(s) in bold or a larger font at the top under your name). You should also ensure that it does not contain anything that is irrelevant or unnecessary, such as the fact you worked at Borders (to use me as an example) or any other job that isn’t relevant to your chosen fields of specialization. If the jobs can prove your competence in a field (such as a stock broker, insurance agent or quality assurance rep at a company) then by all means include it. The following suggestions are from “Resume Writing for Freelancers” by Beth Podrovitz and Jiri Stejskal, which was published in the February 2006 edition of the ATA Chronicle. I am not using the block quote tag, because it made the text look cluttered. Here are some suggestions on how to make your resume stand out. * Keep the document to one or two pages. Remember, this is a resume, not a CV. As such, it is important to summarize the most significant highlights of your professional skills that are relevant to the position you are applying for. A project or vendor manager’s time is limited. They spend only a few seconds looking at your resume to see if it is worthwhile to keep reading. * Indicate your source and target languages. This information is important and having it clearly visible at the top makes it easier for project or vendor managers to find when they go looking for a specific language pair among the many resumes they have on file. If you translate more than one language, include it, but differentiate your strongest language pair from the others. * Indicate your specialization. It is likely to be the second thing a project or vendor manager looks for on your resume. When looking for a particular area of expertise for a project, many translation companies use indexing and key word search tools to help them sift through the resumes on file. Having your specializations listed will help ensure that a word search leads to your resume. For example, if you are a German medical translator, make sure you list the words “German” and “medical.” If you are just starting out, you may not have substantial experience in a particular field, but it is still a good idea to indicate something you would like to specialize in and that you are actively pursuing. * Submit your resume online, preferably in PDF format as an email attachment. A PDF file looks professional and can be viewed on different platforms without altering the fonts you use. It also indicates that you know how to create a PDF file, which many translation companies see as a valuable skill. * List complete contact information. Make sure you include your mailing address, phone number, fax number, and an accurate email address that you check regularly. * When saving your resume on the computer, use your last name for the filename. Don’t name your resume something generic like “U.S. resume” or “translator 1 .” This just makes good sense, especially when submitting your resume online, since translation companies will typically file an applicant’s material under their last name. * Indicate your educational background in the proper place. If you graduated recently and do not have much work experience, make sure you emphasize your education. If you are an experienced translator or interpreter, you can move the education information to the end of your resume and emphasize your work experience instead. * Provide relevant information only. For a freelance position, it is not necessary to show that there are no gaps in your employment history. You don’t need to write down that summer you spent pouring concrete or waiting tables, unless perhaps you were waiting tables at a cafe in Paris or Madrid. * Indicate your experience with computer-aided translation (CAT) tools and whether you use such tools on a regular basis. Do you own and are you proficient in the use of a particular tool, such as TRADOS 7 Freelance? If the answer is yes, make sure it is reflected on your resume. Make sure you list specific CAT tools, since this is another area where translation companies use indexing and key word searches. * Provide information on your desktop publishing (DTP) capabilities. Skills in using DTP applications such as InDesign or QuarkXpress are good to have, as they might set you apart from other translators. * Proofread your resume thoroughly and have others proofread it. This is particularly important if your native language is not English. Of course, even native English speakers are not immune to typos and poorly worded English. Remember, you have designed your resume as a tool for selling your linguistic skills. If a resume is not flawless, your capabilities will appear questionable. * Include relevant association memberships and credentials, such as ATA certification. * Update your resume frequently. Sending out an updated resume is a good excuse to make additional contacts with translation companies. This will also help to keep your name fresh in the minds of prospective clients. * Don’t use colors, photos, word art, and graphic images unless you have a good reason to do so (such as using your logo). * Don’t state your date of birth, number of children, marital status, or other similar personal information. This is a common practice in other countries, but is not advisable for U.S. resumes. * Don’t provide a list of your dictionaries. You can provide this information if requested, together with other resources you are using. * Don’t describe your hardware and don’t list standard software applications such as MS Office. It is assumed that you already know how to use these programs, and the reader will wonder why they are listed. However, you might want to mention which platform(s) you are using, especially if you are a Mac user. * Don’t leave the Track Changes feature on in Word. This may seem obvious, but the number of resumes submitted with tracked changes visible is surprisingly high. Though it is a good source of office ridicule, it is not a good way to present yourself to a potential client. Check your view settings and make sure you see what you want everyone else to see. This blooper can be easily avoided if you submit your resume in PDF format as suggested earlier. * Don’t leave unused generic fields when using a template. Resume templates are fine to use, though they are fairly obvious to a reader who has seen hundreds of resumes. There is nothing wrong with using a template, provided it is appropriate for your purpose and is correctly customized to suit your needs. * Don’t submit your resume in nonstandard applications, such as MS Publisher. * Don’t include your rates. Of course, it is important that the project manager knows what you charge, but your resume is not a good place to provide such information. It is a good idea to submit a separate document containing your rate information, or to include such information in an accompanying message (or cover letter). * Don’t use silly or unusual fonts. Use a common font like Arial, Helvetica, Times, or Times New Roman. * Don’t use acronyms. Most of us know what ATA stands for, but standard resume writing suggests you spell out all proper names. If the name occurs more than once on your resume, it is fine to use an acronym for subsequent occurrences. * Don’t write “references available upon request.” You can provide references in a separate document or in your cover letter. * Don’t submit hard copies. While a paper resume can be printed on fancy paper and look impressive, it is the content, not the form, that is important to the project or vendor manager. More importantly, a digital resume is searchable and does not take up physical space. * Last, but certainly not least, don’t make things up—be truthful and accurate. Most translation companies receive resumes on a daily basis and have thousands on file. Because your resume is one of many, you need to make sure you use other marketing tools, in addition to providing a resume, to establish a relationship with a translation company. Examples include follow-up communication and networking at events attended by translation companies, such as a social function at a professional seminar hosted by ATA or another industry association. Having a professional resume is an absolute must for a freelancer who wants to do business with a translation company. Investing time and effort in getting it right will lead to new business and a successful career.